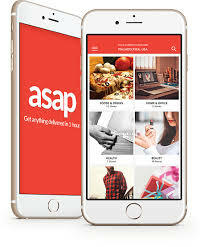 The ASAP app gets you anything you want delivered in minutes. Scroll through hundreds of menus from restaurants and retail stores near you, select what you want and an asap driver will be knocking on your door in under an hour. Users create their own profiles or bring it from Facebook. They can also save their favorite stores and products for easy access. Users can also track the driver in real time, contact them through the app then leave them a comment and rating based on their performance. Payment is made in-app.